The Lord & Taylor Gift Card - it’s the gift everyone loves. Fabulous style, designer names, unparalleled customer service. That’s all part of your gift when you give a Lord & Taylor Gift Card. Whether your recipients use it in store or at lordandtaylor.com, they’ll love the Lord & Taylor experience. It’s the right choice for every occasion. This card can be used for merchandise and services in store and at lordandtaylor.com. It cannot be redeemed for cash, for gift card purchases or applied to your Lord & Taylor store card account. Not valid at Lord & Taylor Outlet Stores. This card is issued by and is property of LT Card Company LLC. For use on lordandtaylor.com, please enter your 10 digit card number, or the last 10 digits of your 16 digit gift card number with PIN. Please keep your receipt. Gift Card balance and terms are available online and at 1.800.950.5327. The value of the gift card does not represent a deposit or an asset account. Lost, stolen or damaged cards may be replaced with a new gift card for the remaining balance upon presenting required proof. Redemption: Gift Cards are redeemable at all Lord & Taylor stores and at lordandtaylor.com. Not redeemable at Lord & Taylor Outlets. "Using your eGift Card is simple: redeem: Online 1. 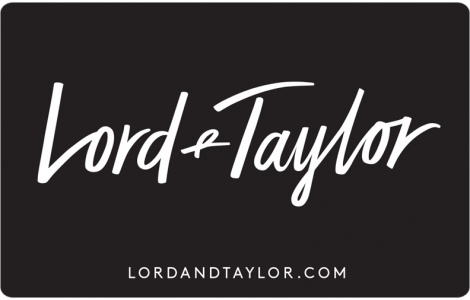 Shop at lordandtaylor.com online. 2. At checkout, use the following code just like you would a regular Gift Card: eGiftCard number: 1234567890 Pin: 1234 [CLICK TO GO TO LORD & TAYLOR] redeem: In store 1. Print this page and take it to one of our stores to redeem for merchandise. 2. To print, please view this eGiftCard from a device that is connected to a printer. [CLICK TO PRINT THIS PAGE]"